Our prep periods really do seem to get away from us – don’t they! Your ‘Crappy Graph’ shows that quite well. Love the PollDaddy. I always use SurveyMonkey but I think I’ll try PollDaddy – the kids will like the instant feedback! Hi Nancy! It is fun doing a Poll Daddy survey with your students because of the instant feedback. Thanks for your comment! I added to your poll. It was difficult to choose just one as I wanted to pick them all. I am also working through the teacher challenge and added a poll to one of my posts. I liked how easy it was. Love the crappy graph. I’m glad you are able to add a poll as well! Yes, I agree that it is difficult to choose just one. 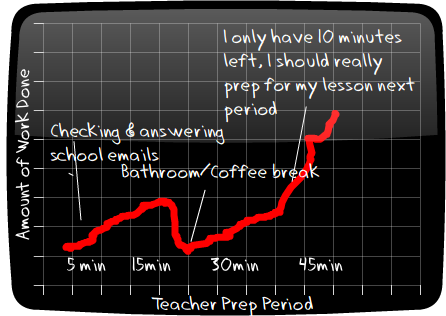 I always get overwhelmed with all the work I need to get done in a prep period! Thanks for stopping by!